Photos. Click on the thumbnail for a larger view, take a look. 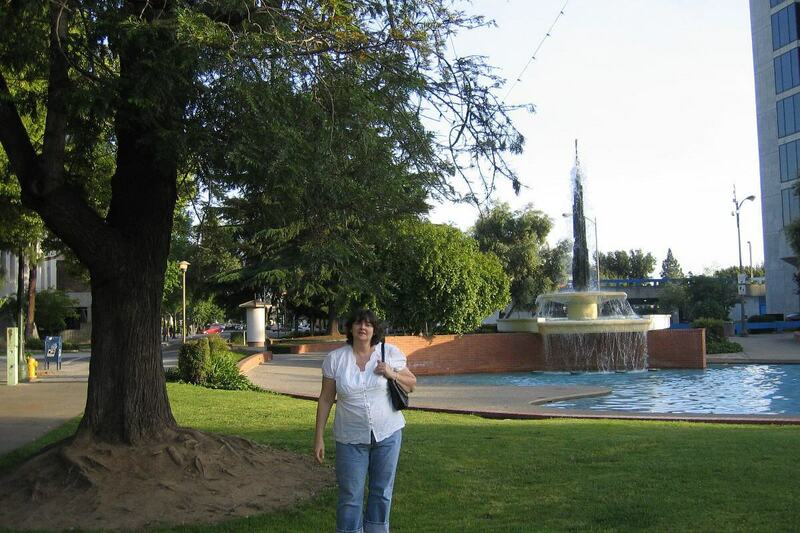 Lisa poses in front of the Hunter street fountain. Old sign spotted as we wait for the doors to open. We waited with about 30 other anxious fans. 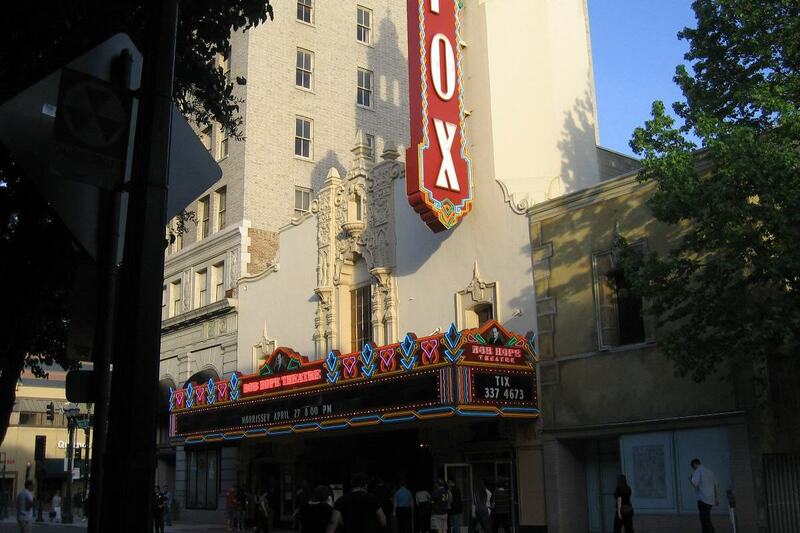 Marquise of the old Fox theater that is now known as the Bob Hope Theater. Our tickets. These are all the photos I have. No cameras were allowed. See below for more. The opening act was very powerful, with a drummer and a singer/keyboardist. The sound was big, loud, powerful and rhythmic but lacked clarity and finesse. The crowd trickled in and yelled for Morrissey in between the opening act songs. Morrissey finally arrived on stage to a standing ovation, the crowd was on their feet about half the time. And we were in the balcony about midway up. Lisa said she enjoyed the show more than she expected. Morrissey has a talent of connecting with an audience and is humble in his words. I loved hearing those old songs and heard lots of audience singing when Morrissey paused or sang quieter. I recognized over half of his songs and all of the old "The Smiths" songs. It was all great except for the fans disrupting and ending the show in the second encore song. Welcome...to the first day...of the official start...of the Asparagus Festival. Morrissey mentioned his stay at the "Holiday Inn and the vacuuming that had to be done at 7:00 am. It just had to be done at 7:00 am!" Morrissey asked the audience "Where the hell would you be if not here right now? Death in a box? That's Jack in the Box." Morrissey also said he has "been to Stockton many times because he has relatives here." Then he asked, "does anyone know where Shilo Place is?" It is a street in Lincoln Village West neighborhood not more than a two miles, as the crow flies, from my house. He also mentioned Bakersfield and that got some crowd reaction. Morrissey also asked if anyone knew about the show Big Valley? He mentioned The actor Barbara Stanwick as a few people mentioned Lorne Green. 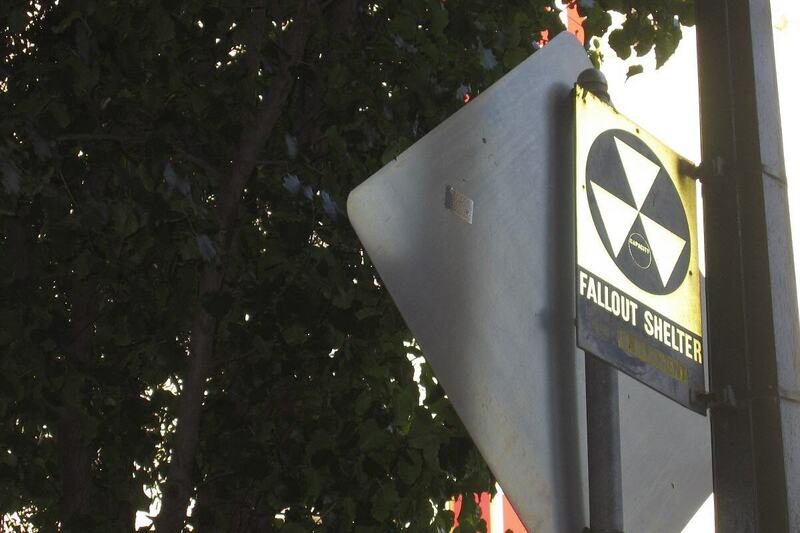 I guess a reference to the show's setting is supposed to be Stockton. "On to Sparks." In reference to the next show in his tour in Sparks, Nevada. See below for more information, the last two articles are like show reviews and are the best. With a set list at the very bottom, check it out. 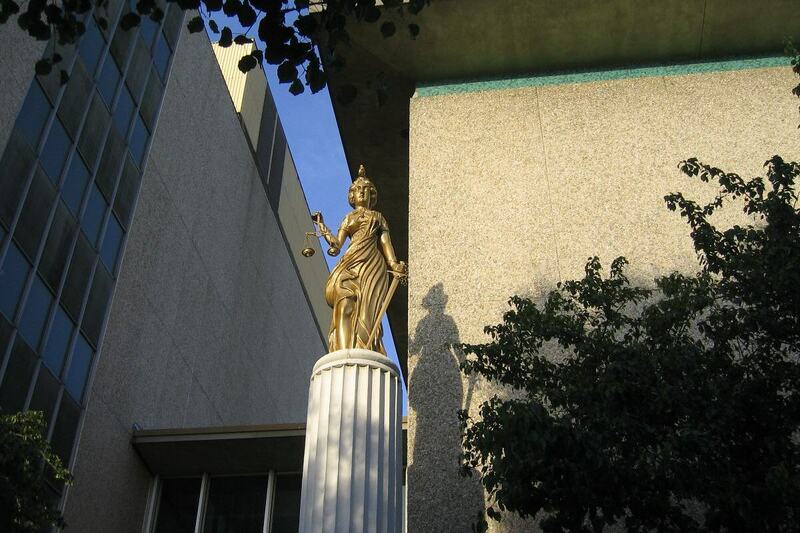 Photos and articles from the Local newspaper web site. Click on the thumbnail for a larger view, take a look. Morrissey, one of rock's most influential musicians, will kick off his summer tour here. The singer will perform April 27 at the Bob Hope Theater, general manager Jacqui James confirmed Friday. Tickets will go on sale March 24, but prices have not been determined. 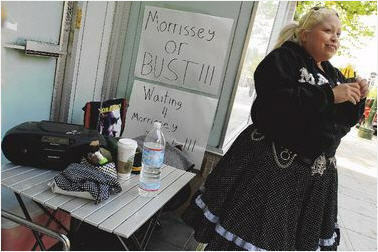 “I know a handful of people right now that are freaking out,?said Morrissey fan Amber Rosaz, 20, of Stockton. “We used to drive around and say, ‘Oh, if Morrissey played Stockton, we’d camp out for days (for tickets). ?We have to live up to what we said. ?Born Stephen Patrick Morrissey, the English singer, 47, became an underground icon in the 1980s as the frontman of The Smiths, a band whose moody, literate guitar-driven pop influenced bands ranging from AFI to Tiger Army. The Smiths disbanded in 1987, and Morrissey has maintained an intense cult following through his solo work. “This is probably one of the most significant concerts Stockton’s had,?said Mat Woods, 26, of Stockton. James noted that Morrissey should draw a diverse crowd. 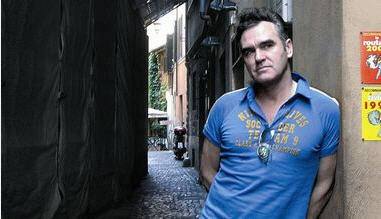 Morrissey has fans in their 40s as well as their teens, and he is a cult favorite among Latinos. Many local music fans were shocked that Morrissey would start his tour in Stockton, which has hosted few, if any, performers like him in the past. The concert is being organized by Live Nation, one of the biggest promoters in the country. Live Nation did not return calls for comment. Rumors about the show had been circulating on the Internet. Two Morrissey Web sites recently posted bulletins stating that the singer was performing at the Hope, leading some fans to call the theater for ticket information before James knew about the concert. “I’m not believing it,? added Keith Hatschek, director of University of the Pacific’s music management program. “It gives fans in San Joaquin County a chance to see and hear a fabulous artist who’s had a huge impact on the music scene.? Fabrizio Sasso, 28, an aide to Mayor Ed Chavez, called Morrissey “one of the greatest frontmen of all time." “For something as good as that to come to Stockton, it’s amazing to me,?Sasso said. “For him to kick it off in Stockton is a tremendous boost to the city and what we’ve done in downtown. ?Downtown will be busy April 27, which also is the first day of the annual Asparagus Festival. “With Morrissey in town and the Asparagus Festival, we’ll be the hot spot in Northern California,? Sasso said. Ivan Betancourt didn't sleep much Thursday night. He was probably awake most of last night as well. His tent does little to keep out the cold, and the concrete sidewalk outside the Bob Hope Theater is hard and uncomfortable. Still, Betancourt doesn't seem to mind losing sleep - it will be worth it when he gets tickets this morning for Morrissey's summer tour kickoff concert April 27 at the Hope. Betancourt, 19, of Delhi and friend Sarita Martinez, 25, of Modesto were first in line for Morrissey tickets, which go on sale at 10 a.m. today. They set up their tent at about 10 p.m. Thursday in the doorway of a vacant storefront next to the Hope ticket office. It's the first time in recent memory fans have camped out overnight in Stockton for concert tickets, and more fans were expected to join the line Friday night. Born Stephen Patrick Morrissey, the English singer, 47, became an underground icon in the 1980s as the frontman of The Smiths. He has maintained an intense cult following with his solo work. "I love Morrissey with the fiery passion of a thousand suns," Betancourt said, adding the singer's lonely, pensive lyrics are "about what I think. He's actually writing lyrics exactly to my thoughts." Betancourt had to work Friday at the Stockton Macy's, so Martinez, a student, kept their spot in line. She sat at a folding table listening to a portable radio and clutching a cell phone in hopes of winning a call-in Morrissey ticket contest. A friend had already won Martinez a ticket; she was in line and trying to buy and win tickets for others. There was a black Morrissey T-shirt folded over Betancourt's empty chair and a hand-written "Morrissey or Bust" sign hung in the vacant storefront doorway. Passers-by smiled, said "hi" and asked about Morrissey. Martinez said she was surprised more fans didn't get in line earlier. She added that spending the night downtown wasn't easy. "All of the bums kept coming over and saying, 'What's a Morrissey?' It was scary," she said. The police also asked Martinez and Betancourt why they had set up a tent. "They didn't believe us. They thought we were into trouble," Martinez said. Theater staffers later called the police, told them what was happening and asked them to occasionally check on the line, Hope General Manager Jacqui James said. The story, in all its breathless and wistful retellings, has taken on the air of myth. 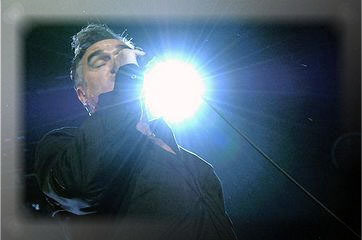 It takes place in 1999 at University of California, Irvine, where Morrissey is performing on his "Oye Esteban" tour. Moz looks out at his mostly Latino audience and tells them, "I wish I was born Mexican." Seriously. I mean, I wasn't there, but I believe it. Now, almost a decade later, the near-religious ardor Morrissey inspires among many young Latinos has been noted and analyzed. In his 2002 paper " 'Do you still love me like you used to? ': Reappropriating Morrissey," Canadian academic Colin Snowsell wrote, "Morrissey's popularity in Latin America and to Latino fans in Southern California has increased rapidly and seemingly in direct proportion to the massive erosion of his original fan base." Still, for many, the relationship continues to baffle. Morrissey kicks off a North American tour tonight at the Bob Hope Theater. Steven Patrick Morrissey was raised in Manchester, England, by Irish Catholic immigrants. In 1982, he and guitarist Johnny Marr formed The Smiths. The band dissolved five years later but has been heralded as one of the most influential acts in rock history. In 1988, Morrissey launched his solo career with the album "Viva Hate." While 1999's UCI moment might have encapsulated the soul of the Latino-Morrissey romance, it is hardly the only token of affinity to spring from it. A few years later, por ejemplo, Moz shared the stage with Jaguares, on the rock en espanol group's "Revolucion 2002" tour. Wallie Mason, a lawyer and Discovery Bay resident, has been listening to Morrissey since 1987. She will be at tonight's concert after seeing him two months ago in Pasadena. At that show, Mason noted, many of the concertgoers were Latino. "I feel like it has to do with alienation," she said of the attraction. "If you know about Morrissey, he's the son of two Irish immigrants. I think there's some parallels between the Latino community in the U.S. and the experience of being Irish in England, of belonging and not belonging. There's a current in his writing that touches on that." Keith Hatsceck, chairman of the music management department at University of the Pacific's Conservatory of Music, agreed that Morrissey has a "large and loyal fan base" but has not so far observed a particularly Latino affection for the singer. 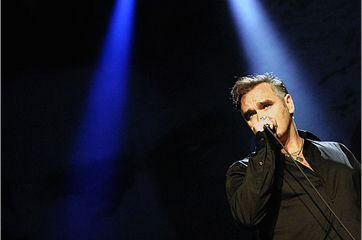 Generally, Hatschek said, Morrissey attracts devotion because "quite a bit of his music has deep emotional content to it. He somehow manages to convey something in every song he sings to the audience." Other critics of music and pop culture have noted Morrissey's ability to relate to his audience and drawn connections between his tone of opulent melancholy and that evoked in some of Mexico's ranchera music. Take, for example, my 17-year-old self, lying sideways on my bed with my feet against a wall in a northeast outpost Moz Angeles. I am gloomy over some unrequited affection. Morrissey got it. Like, really, really got it. "Last night I dreamt that somebody loved me," he sang on The Smiths' "Strangeways, Here We Come," album. "No hope, no harm, just another false alarm." I suppose I could just as easily have been listening to the ranchera, "Noches Eternas:" "How eternal are my nights, how slow is my agony, how sad is my life, to live thinking about you." 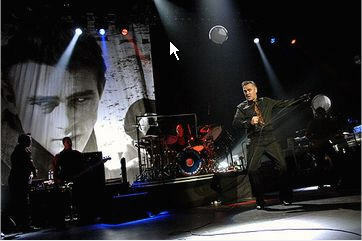 But in his 2002 take on the Morrissey-Latino subject, the Orange County Weekly's Gustavo Arellano noted that Latino Moz fans don't necessarily connect his music to their ethnic upbringing. All the same, there remains in our culture a taste for the slightly cloying, the nearly overwrought, the delightfully macabre. (See flan, telenovelas or el Dia de los Muertos.) In that context, maybe Morrissey makes some sense. Vanessa Valdez has been a fan since she was 12. The Stockton woman, now 20, said, "I like how his voice, it's very distinct. Maybe it's just the lyrics and, I don't know, the messages in the songs. I mean, 'Irish Blood, English Heart'! He knows what I'm feeling." Exactly. Morrissey had been grabbed one too many times. The iconic English singer cut his encore short Friday at the Bob Hope Theater and rushed off stage mid-song after a fan tore open his shirt and nearly tackled him. It was the culmination of 90-minute concert that began as a rock spectacle and ended in a frenzy as fans surfed the crowd in hopes of touching the star. Security guards found themselves overwhelmed as they tried to stop it, and a few fans got through to Morrissey. One male fan gave him a long kiss on the cheek. He acknowledged some on stage by smiling and holding their hands. Others grabbed him tightly and refused to let go until security pulled them away. 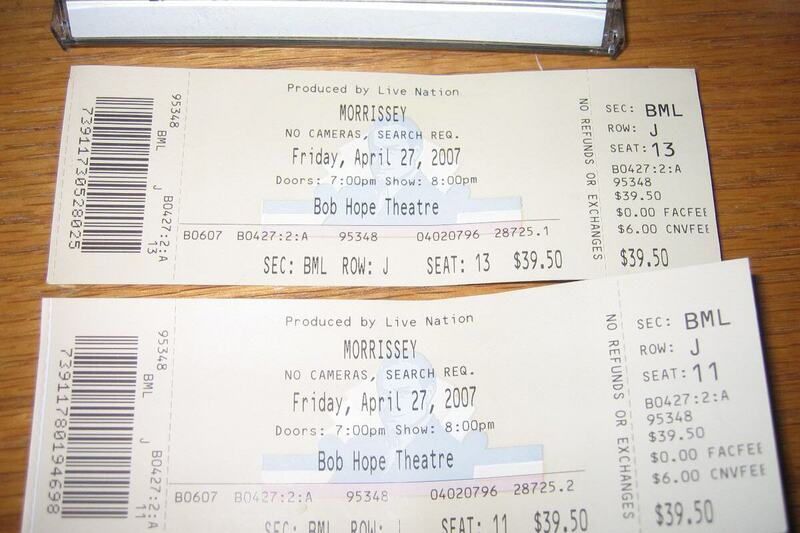 Some at the Hope said fan behavior there was more extreme than at Morrissey shows they had attended in the past. But it’s also not unusual for fans to express intense devotion to him. Born Steven Patrick Morrissey, the singer’s vulnerable and sweet indie rock has developed a strong cult following over two decades. He first became an underground icon in the 1980s as the frontman of the influential band The Smiths, which broke up in 1987. Since then Morrissey has released several solo albums and maintained his devoted fan base. Friday’s show kicked off his summer tour, and tickets were sold to fans in England, Germany, Florida, New York and San Diego. Audience members began packing the pit area in front of the Hope stage almost immediately after the opening act, Kristeen Young , finished her set. Security guards cleared the area only to have fans flow back in once Morrissey took the stage. The 2,000-seat Hope was nearly full for the concert. 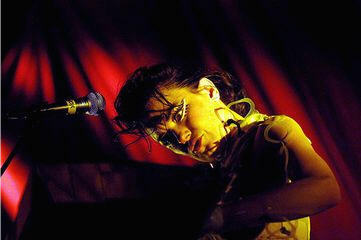 He opened with the hard-driving Smiths' track “The Queen is Dead,?which featured a thunderous drum roll. 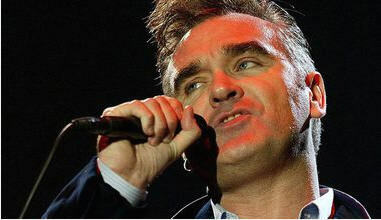 Once rail thin and almost gawky, Morrissey now has graying temples and is somewhat husky. Wearing black slacks, a black shirt and an orange tie, he stayed near the front of the stage and reached into the crowd, holding fans?hands. He also continuously ran his hands through his hair, across his chest and over his face, which twisted to reflect the pain and emotion in his lyrics. Morrissey didn’t just play a show; he gave a physical performance. His five-piece band, meanwhile, simply rocked, using aggressive drum rhythms and guitars to peel the gleaming polish off Morrissey?music and show its fiery heart on songs like “Irish Blood, English Heart?and “In The Future When All’s Well. ?“Welcome to the first day of, the official opening of, the Asparagus Festival,?he said before starting “Irish Blood, English Heart,?drawing laughs from the crowd. A fan ran on stage for the first time during “Disappointed? and was pushed back into the audience by security. Throughout the rest of the show, which also featured the Smiths' hits “How Soon is Now? 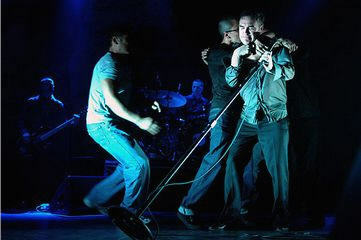 ?and “The Boy With the Thorn in His Side,?guards were periodically running across the stage and grabbing eager fans who had crowd surfed to the front in hopes of reaching Morrissey. The singer seemed to revel in their devotion at times. Early in the concert, he took off one of the shirts he wore during the show and threw it into the crowd. Fans knocked each other over, tearing it apart in hopes of getting a scrap of wet fabric. The situation exploded during the first encore, with several fans hitting the stage at once and overwhelming the guards. Morrissey seemed to take it in stride, fighting off those who grabbed him too hard or too long. During the second encore, however, an overly aggressive fan apparently pushed Morrissey too far. The fan ran at the singer and grabbed him high on the chest, ripping his shirt open. As the fan dove back into the crowd, Morrissey ran off stage with his band, and the house lights went on a few minutes later. Some in the audience left disappointed and angry at how the show ended. Morrissey's music thrives on the sullen side, but this was just a bummer. Friday night's show at Stockton's Bob Hope Theater was cut short, with Morrissey huffing off stage and his bandmates following right behind. Morrissey-mania had gone too far. An overzealous fan, who just might double as a Greco-Roman wrestler, leaped on stage and practically tackled the singer. Gee, can't a guy just sing "First of the Gang To Die?" So those last few songs of an otherwise solid set will remain a mystery. The house lights went up abruptly and the crowd sauntered into the downtown Stockton streets, where little remained from the nearby Asparagus Festival except heartburn. Morrissey's concert was also a celebration, albeit one that fizzled in the finale. The show kicked off his latest tour, a retrospective of Morrissey's solo work plus songs from his former band, the late-great Smiths. He's alternative-rock royalty, the great king of pain. So they packed the theater, some 2,000 fans representing Morrissey's diverse demographics: rockabilly dudes and dudettes, aging metrosexuals and 30-somethings who know all the lyrics to "How Soon Is Now?," and Latinos - lots and lots of Latinos who fancy Morrissey as the second coming of Pedro Infante. Now, stage jumpers are nothing new at a Morrissey show. It's a kind of tradition, like singing along to "Suedehead" or the dog pile that erupts when Morrissey throws his shirt into the crowd. Morrissey more or less obliged everyone who jumped on stage, hugging back or offering a quick handshake while security pried fans away and pushed them back in the crowd. But after being bumrushed by at least 17 fans, and a final one who didn't know when to quit, Morrissey reached his breaking point. But until then, the concert ran fairly smooth. Morrissey's croon sounded fresh and tragic as ever as he pined through "Everyday Is Like Sunday." He delivered an exquisite version of "Please Please Please Let Me Get What I Want" that left one fan crying in her vintage dress. And Morrissey (born Steven Patrick Morrissey) looked pretty dapper, especially for a guy who's pushing 50. He wore snug black pants and a series of shiny dress shirts, always opened a few buttons to accentuate his chest, and even ditched his shirt to reveal a respectably flat tummy in "Let Me Kiss You." Que suave! Morrissey kept moving while singing of sexuality and sadness, rubbing his hands over his heart and rolling his eyes back in his head. He was also in a fairly chatty mood, and riffed on the Asparagus Festival, "glamorous downtown Stockton" and his hotel room (darn those housekeepers vacuuming at 7 a.m.). The concert had powerful moments, too. "How Soon Is Now?," one of the Smiths' signature tunes, was hypnotic as ever with its strobe light-like guitar line and lyrics that've been a soundtrack for so many lonely Saturday nights ("And you leave on your own/and you go home and you cry and you want to die."). Too bad the Bob Hope Theatre's acoustics were so mushy. Morrissey's five-piece band didn't play exceptionally loud, but the singer sounded buried in the din. The theater is spectacular and ornate, but just doesn't have the sound to match. The concert also dragged slightly toward the end of the main set. "I Will See You in Far Off Places" and "Life Is a Pigsty" were heavier on guitar, though kind of plodded along. But everything got back on track, at least for the time being, with that version of "Please Please Please Let Me Get What I Want." Ultimately what everyone wanted was a proper finish to the show, not Morrissey stomping away from Stockton. So sad. 1. "The Queen Is Dead"
2. "Irish Blood, English Heart"
3. "In the Future When All's Well"
4. "I Just Want To See the Boy Happy"
8. "Let Me Kiss You"
10. "The National Front Disco"
11. "How Soon Is Now?" 12. "You Have Killed Me"
13. "I've Changed My Plea to Guilty"
14. "The Boy With the Thorn in His Side"
15. "Everyday Is Like Sunday"
17. "I Will See You in Far Off Places"
18. "Life Is a Pigsty"
19. "Please Please Please Let Me Get What I Want"
20. "You're Gonna Need Someone on Your Side"